NICAP received a telegram in June 1961 notifying us about the existence of some color movies of a UFO taken by a 16 year old boy, Craig Seese. Our informant was Robert William Miller, a young man with serious interest in UFO investigation who had formed his own group for that purpose. Mr. Miller had been one of five witnesses to the UFO sighting and filming. A meeting was arranged between the youths, and Mr. A. B. Ledwith, a NICAP member in the area with technical background (including photographic analysis work with Smithsonian Astrophys- ical Observatory). Mr. Ledwith was requested to advise NICAP whether he considered analysis of the film worthwhile. After talking to the youths and viewing the film, Mr. Ledwith recommended analysis of the film and advised Mr. Seese to have several copies made, storing the original in a cool safe place. Mr. Miller was advised to forward one copy of the film to Max B. Miller in Los Angeles for analysis. (NICAP paid for the printing of one copy of the film for this purpose). The film was sent to Max Miller by registered mail August 7, 1961. About this time photographic analysis work began to pile up on Max Miller, and other commitments began to make demands on his time. As a result several analyses in the past two years are either incomplete or still pending. Max Miller is no longer a NICAP Special Adviser, and other arrangements are being made to complete the analyses. The film seems to have disappeared at this point. NICAP does not include it on its web site and it does not appear on You tube anywhere. I can only suspect that the film was of such poor quality that it was not required to be preserved or it had a potential explanation. There really is not a lot more information than this. We don’t know what happened to the film. Loren Gross has nothing to say about the case in his history and the film was never sent to Blue Book. However, there is some mention of it in the news media. 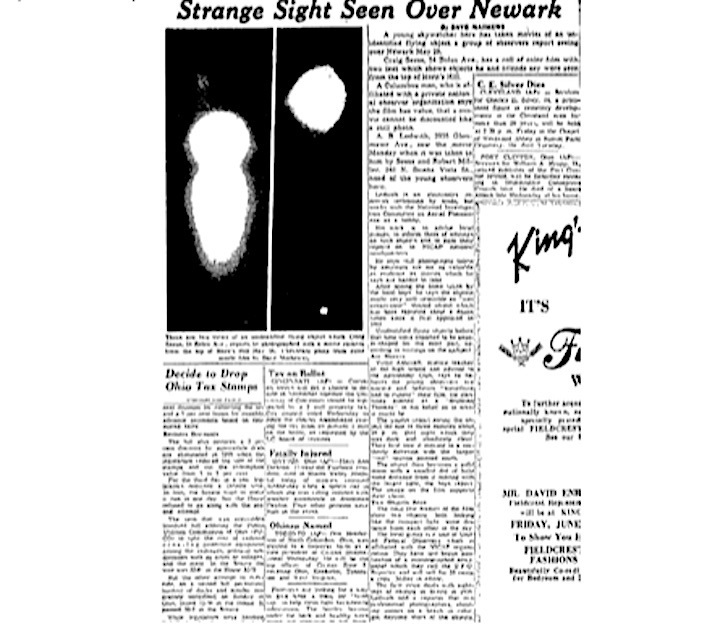 The Newark Ohio paper describes a bit of the sighting in the June 22, 1961 edition. The paper provides us with some frames from the film but they probably do not do the film justice. Also mentioned in the paper is the statement of Virgil Ashcroft, a science teacher at the local high school. He also was an advisor to the astronomy club. He was skeptical and felt that something was seen and recorded but could not hazard a guess as to what it was. Ashcroft apparently was not too impressed by the film but, as stated in the UFO evidence, NICAP was. They added the note that it was “worth analysis; or possible value in conjunction with other data”. Let’s examine what we know about the film. It was shot between 10 PM and midnight. There were no significant astronomical events that night but the moon was full and would illuminate any physical objects in the sky. There is no Blue Book record for any sightings in the region on May 29, which makes one wonder what, if anything, was recorded on film. The speed of motion picture film is pretty slow and it is difficult to record any nocturnal lights with the equipment described. What- ever was recorded would have to have been pretty bright. It is possible that what was filmed was an aircraft with a bright light and contrail illuminated by the full moon or setting sun. However, there is not enough information available to draw any definitive conclusion. Could this film have been nothing more than a hoax? Perhaps a known stimulus was filmed and then a story was created to make it appear like a mysterious object. This possibility has to be considered. The still images in the newspaper are unimpressive, which makes me conclude that this is not “best evidence”. At best, it is a noc- turnal light with a potential earthly explanation. At worst, it was nothing more than a hoax, which, as Hendry noted, is common with films and photographs. In my opinion, without the film this case is not very good evidence at all. Even with the film, we are left with the possibility that the details regarding the film may not be accurate. Based on what we know about the film, I would consider this film insufficient information or a possible hoax. It should be removed from the best evidence category.